In the first part of this series, I introduced the O-train and how it works as a transit line. The second part is how it got running, and how cost effective the project was. Naturally, these projects are not directly comparable, but generally one should expect cheaper projects to get less riders, so that the ratios work out to be at least in the same order of magnitude. But the O-train is a bit of an out-lier, even compared to the initial segments of the Calgary C-Train, which is considered one of the most cost effective transit projects in North America (by attracting a lot of riders to the relatively low cost rail lines). 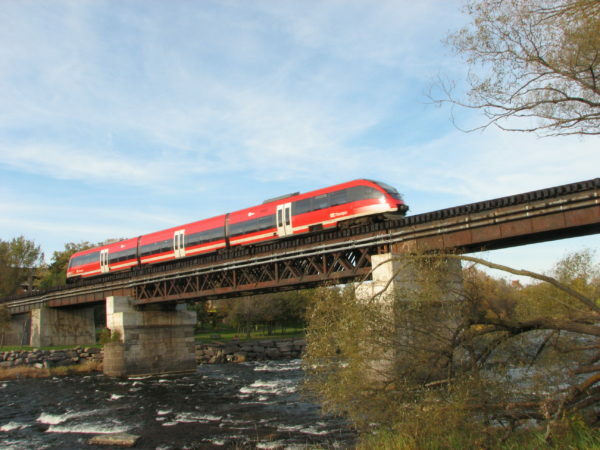 Several of the items appear pretty cheap, compared to other projects throughout North America – for example the reconstruction of one commuter rail station near Montreal cost 20$ million by itself. Consider the cost of the stations: less than 6$ million for 6 platforms, that’s less than a million per platform. It certainly helps that the platforms are only 35m long, and built very simply with identical design, with an asphalt or concrete surface and bus-style shelters. Also, no parking. The stations are pretty spartan. These numbers are approximations. There’s been inflation over the years, the capacities may not be exactly comparable (i.e. by removing seats, capacity can be increased, and standing capacity can be counted in different ways), just like the trains themselves (e.g. some trains are more powerful than others). Also, the cost of the vehicle depends on the size and kind of the acquisition contract. The approach to vehicle acquisition was to buy the three trains for $17.1 million with a guaranteed buy-back of $13,537,500 after the two-year pilot phase for a net cost of $3.563 million. Basically the trains were a lease for the two year pilot project, and had to be paid off when the project continued. This makes sense, given that the O-train started as a 2-year evaluation project, and it could’ve been discontinued after that. But it results in an unfair comparisons with other projects that use the full capital cost of the vehicles involved, and so that fact should be kept in mind. It is still a pretty decent deal considering how small the order was, and how quickly the trains were delivered. Apparently they came so quick and affordable because they were surplus/option trains from a larger “BR 643”-order made for Deutsche Bahn (unfortunately I couldn’t find a source for that original order, or what exactly the option/add-on deal looked like). Presumably this explains the similarity with the DB trains, and some of the German signs that exist on the train. DB actually preferred a more powerful version of the train, the “BR 644”, which uses a diesel-electric rather than a diesel-mechanical drive, which allows faster acceleration and mixes better with electric trains. Ironically, the diesel-electric version would be more appropriate for the O-train with its short interstation distances, Ottawa probably uses the diesel-mechanic Talents in its most rapid transit-like application. The infrastructure was leased, just like the trains. The contract was with CP (Canadian Pacific Railway), who owned the infrastructure, as a public private partnership. CP provided the corridor, upgraded the infrastructure, built the stations, and provided the maintenance facility. The partnership also included Bombardier for trains, their maintenance and the signalling system. The lease included the provision to purchase the corridor for around 11$million at the end of the contract. There was also an option to extend the lease for two years – which the city exercised, and finally purchased the corridor in 2005 (at which point the city also paid half a million in deferred costs from the original design/build). CP actually considered the corridor lease too low, so there was a clause in the contract for ‘incentive payments’: for every passenger above 5100 per day, CP was supposed to be paid 70 cents per passenger. By the end of 2005, 380K$ of those incentive payments had accumulated (it seems that CP waived about 200$K of those when the city purchased the line in 2005). This seems like another way in which the capital budget was kept a bit lower, possibly at the expense of future capital costs (or operating costs, depending on how the accounting is done). On the other hand, this may have also provided an actual incentive for CP to make the line attractive for users. It is clear that the O-train was a cost effective project in terms of capital costs. But it may not be quite as cheap when deferred capital costs are considered. Once the total cost for the vehicles and and corridor are included in the capital cost estimation, the total cost is around 40$million, double the initial capital budget, but still pretty low. 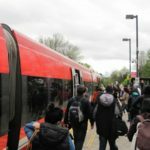 It should be expected that the operating cost of the O-train are not very favorable compared to buses. There is a lot of infrastructure and vehicles that need to be maintained. The fact that this is such a short line, with relatively few riders per km compared to actual rapid transit lines, and a tiny vehicle fleet doesn’t help, in terms of economies of scale. Plus, with three trains, two of which are always operating, at most two thirds of the fleet is operating. Such a high spare ratio should result in higher operating costs. 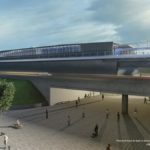 Additionally, the project seems to have been designed with the desire to keep capital costs low, so costs may have shifted to the operations side. It certainly helps that the ridership is pretty high given the scope and line length of the project. 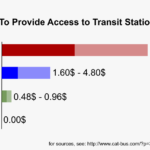 Nevertheless, the operating cost per passenger was higher than for buses during the initial years: during the first years, only about 30% of the cost was covered by ticket fares, compared to about 55% for the OC Transpo system as a whole. Nevertheless there are cost-effectiveness measures on the operations side that are interesting and unique. For one, the O-train was the first federally regulated railway using single man operation (i.e. no conductors). Additionally, the drivers where actually taken out of the pool of OC Transpo bus drivers, instead of hired locomotive engineers. When the system started, 28 bus drivers completed the training to operate the O-train. This large reserve pool means that there is never a shortage of drivers, contributing to the service reliability of more than 99% (compared to 70% for the overall system). And when the drivers are not operating the O-train, they are still operating buses. This is an interesting approach not only to reduce the costs of reliably providing vehicle operators, it also addressed the concerns of the labor union, which saw the rail line as a threat to their members’ livelihoods. 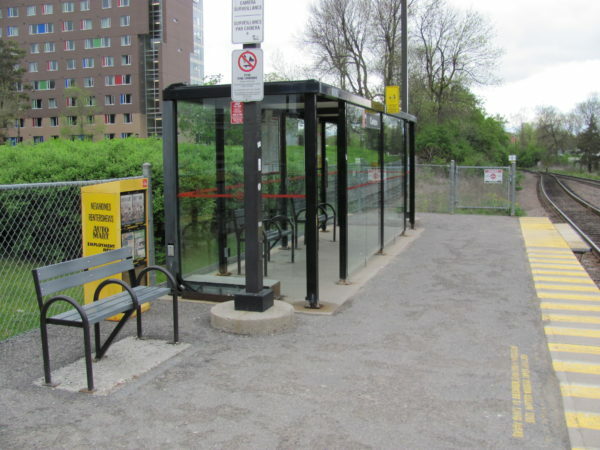 Overall it should be obvious that the O-train was a very low-cost project. For a rail project, especially one of this small scale, it seems to have been very cost-effective. However, the costs may not be quite as low as they appear at first sight – one has to be careful to not count the start-up costs for the evaluation project as the capital costs of the transit line. Other projects attempting to emulate the success of the O-train should be mindful of that.